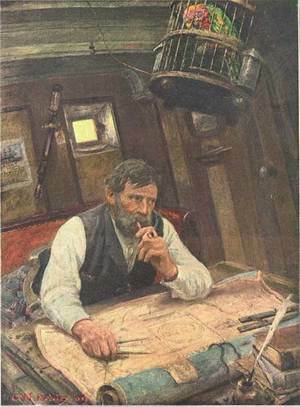 Geoff Hunt has been painting cover art for Patrick O'Brian's Aubrey-Maturin series of historical novels since 1988. A comprehensive gallery of Hunt's marine art can be viewed here. That second link is a little curtailed. Cur-tailed. Get it? Ah, you're a scurvy reptile. That second link, it must be the dog watch then, eh mate? I love the sketch of the dear Surprise in mourning. Hm. I believe it is time for my annual rereading of all 21 books again. Good thing I finally got that Aubrey-Maturin concordance. The Dear knows how I love these books, for all love. Love the books, love the art. So evocative. When I get my seaside cottage, I'll have to keep these in mind. Lovely art. If I had the money some of the Aubrey-Maturin ones would definitely be gracing my walls. So which idiot at Harper Perennial decided to replace them with photographic covers (for example, Master and Commander or The Mauritius Command) which depict some guy who is certainly not Jack Aubrey, being both not overweight and having short hair? Which I'm not sure Mr. Hunt got the likeness of the steward quite right in this painting, either. Makes him look scruffy. Actually, that series has been discontinued, and all of those books have been remaindered, so it's been possible to complete my collection at half-price. The books are difficult to find at used bookstores around here, although there is one bookstore in a nearby town that just received multiple estate-sale sell-offs of people who had collected the series, so I grabbed a number of the books with Geoff Hunt covers.